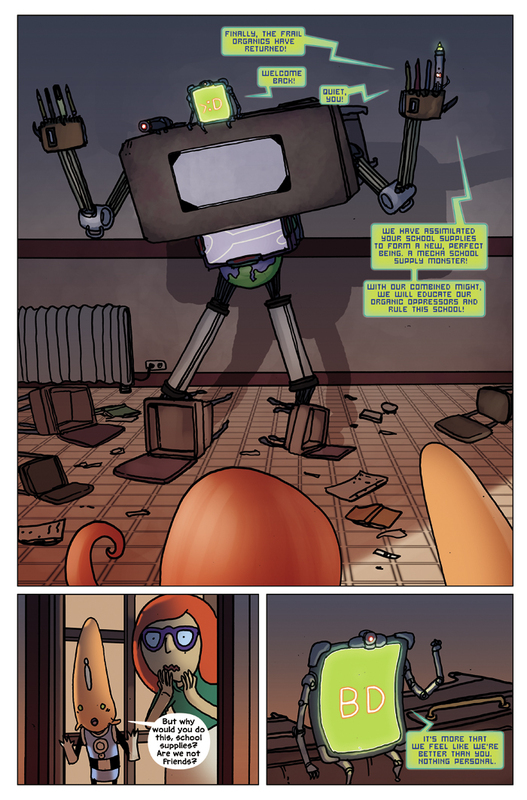 It’s Friday, and that means an epic reveal in the latest pages of Albert the Alien! BEHOLD! The alien school supplies have assimilated the other Earth supplies to form a Mecha School-Supply Monster! They have decided to take over our educational system and clearly have a very different (and more scary) teaching style than what we are accustomed to on our planet. However, their actions appear to even be surprising Albert. So this is not a common activity for them. And perhaps we’ll find out why…but later. Gabe did a fantastic job taking every day items we see in a classroom and using them as components to make a machine of awesome educational power. I do not often tell Gabe how to design anything – so it’s always a refreshing surprise when I see what he comes back with on a new character like this. And I think he hit it out of the park with this one. So now the kids have to figure out how to defeat this monstrous machine of educational awesome – and save the school – before the end of the day. Can they do it? Find out as we continue to update every Wednesday and Friday!